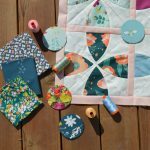 Summer is winding down, the kids are back to school here, but I am still all over that colorful summery mood when it comes to sewing. Last spring, one of my favorite magazines, Uppercase, released an issue with the theme of CMYK. It’s an artsy, creative mag and each issue has a theme related to some type of art, creativity or general curiosity. The CMYK issue just grabbed me for some reason…you see, CMYK stands for Cyan, Magenta, Yellow and Key (black). These are the primary colors of printmaking. Everything you see in print is made with a combination of these colors and I felt totally inspired by all the featured projects and articles. You can guess what came next: “I need a quilt with CMYK!”. Already among my favorite color combinations, these slightly off-beat primaries look amazing together! 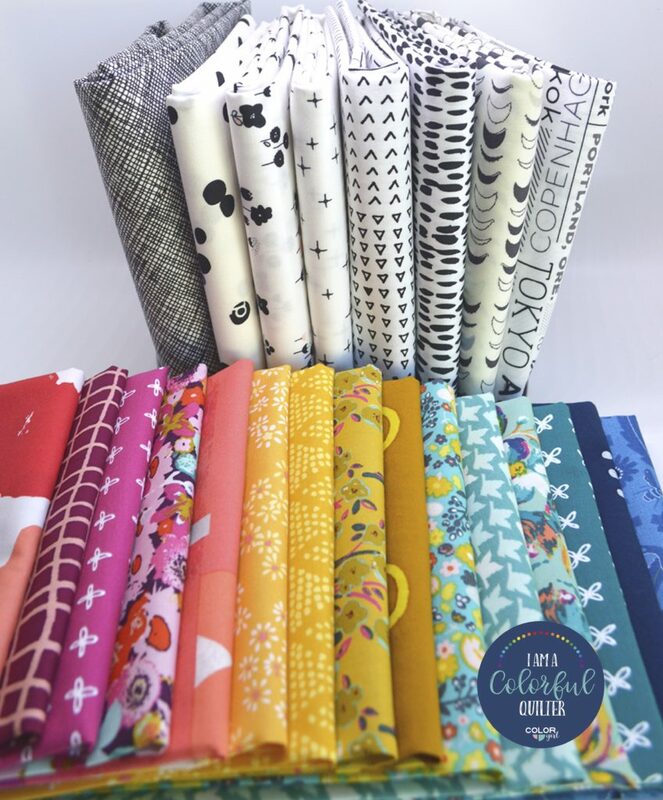 I chose the Whimsy Garden pattern and picked a bunch of fabrics from my shop. The palette consists of mainly tonal prints in those main colors, but there are also a few rainbow-y ones to tie it all together. How fun is that scrappy background? that’s a variety of black and white prints, which I seem to be a bit obsessed with right now. 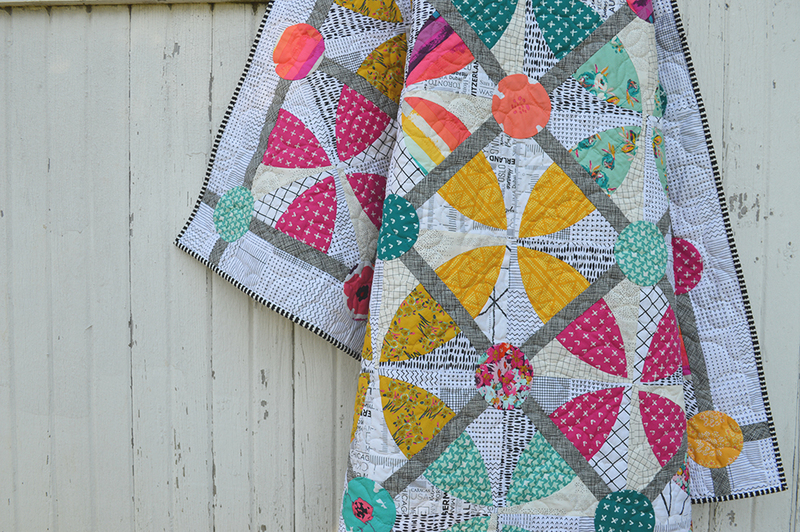 I love how the scrappy prints add a bit more “whimsy” to this sweet quilt. Thankfully, since I was short on time earlier this summer (other commitments and travels), my sweet and so talented mom agreed to sew up this little quilt for me. She did the piecing and Darby of Quilted Squid quilted it up for me. I finished it up with binding (how about that black and white stripe?!) while I was on vacation earlier in August. This cutie was truly a team effort and couldn’t be more fun! 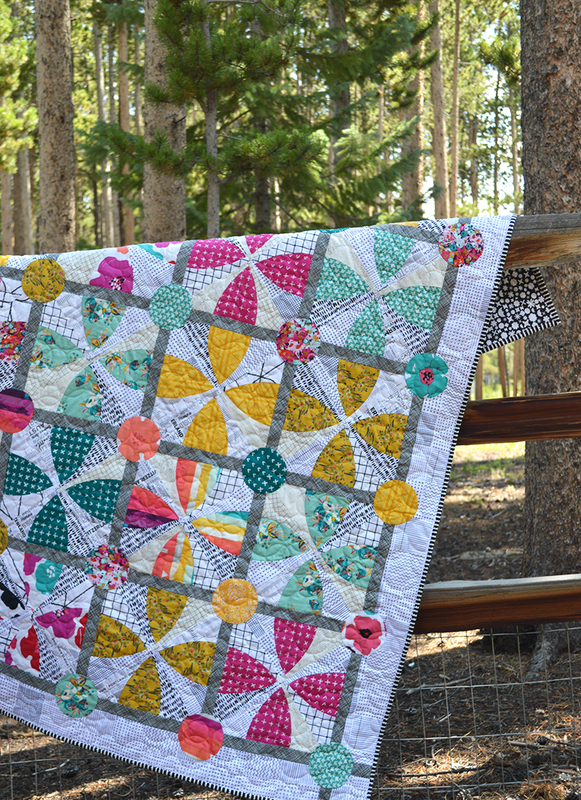 It’s kind of funny how this quilt came about: inspired by a magazine and the colors of printmaking, translated into fabric and brought to life in quilt form. It’s a great story and now you can make one of your own. 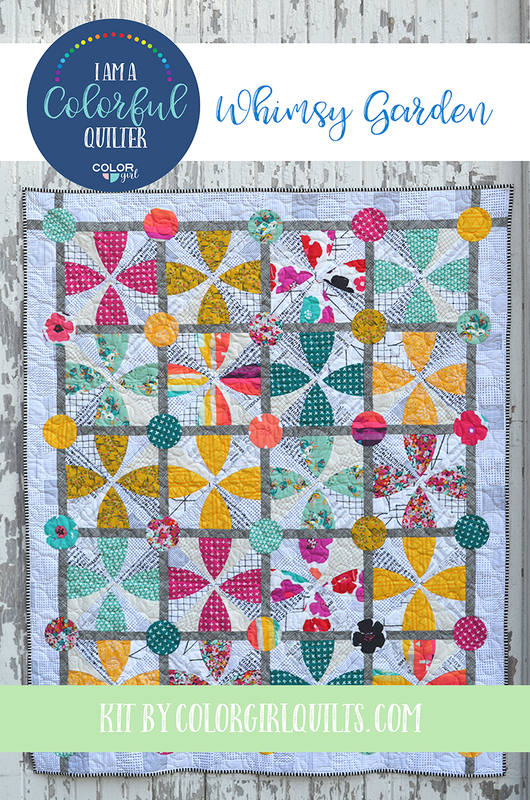 The Whimsy Garden quilt kit is now available in the shop. 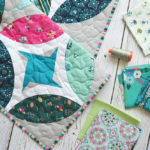 Kit includes fabrics shown in photo above, enough to make the 49″ x 60″ quilt top plus the pattern booklet that gives you all the instructions you need to cut and sew. 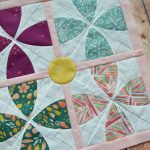 The curved piecing shapes are quick to cut with the Classic Curves Ruler and sew up with ease. Whimsy Garden kits ship free in the US with code “freeship75”, international customers get $10 off with code “discount”. You can also get a simple CMYK fabric bundle, see it here. 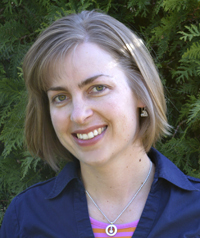 Find black and white stripe for the perfect binding, Here.